The Iroquois were a League or Confederacy of tribes in the Northeastern part of America. 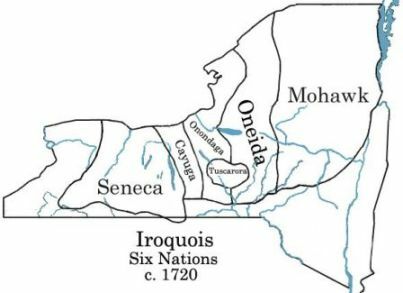 Originally they were formed by five tribes: the Cayuga, Onondaga, Mohawk, Seneca, and Oneida. Later, in the 1700s, the Tuscarora tribe joined. The French named them the Iroquois, but they called themselves the Haudenosaunee which means People of the Longhouse. The British called them the Five Nations. How was the Iroquois League governed? The Iroquois had a type of representative government. Each tribe in the Iroquois League had its own elected officials called chiefs. These chiefs would attend the Iroquois council where major decisions were made regarding the Five Nations. Each tribe also had its own leaders to make local decisions. 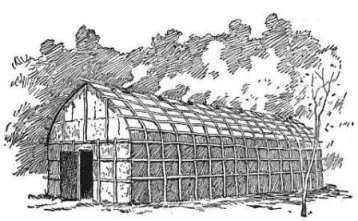 The Iroquois lived in longhouses. These were long rectangular buildings made with wood frames and covered with bark. They were sometimes over 100 feet long. They didn't have any windows, just a door at each end and holes in the roof to let smoke from cooking fires out. Many families would live in a single long house. Each family would have its own compartment that could be separated from the others for privacy using a partition made of bark or animal skin. Longhouses were part of a larger village. A village would have several longhouses which would often be surrounded by a fence called a palisade. Outside of the palisade would be the fields where the Iroquois would farm crops. The Iroquois ate a variety of foods. They grew crops such as corn, beans, and squash. These three main crops were called the "Three Sisters" and were usually grown together. Women generally farmed the fields and cooked the meals. They had a number of ways to prepare corn and the other vegetables they grew. The men hunted wild game including deer, rabbit, turkey, bear, and beaver. Some meat was eaten fresh and some was dried and stored for later. Hunting animals was not only important for meat, but for other parts of the animal as well. The Iroquois used the skin for making clothing and blankets, the bones for tools, and the tendons for sewing. Iroquois clothing was made from tanned deerskin. The men wore leggings and long breechcloths while the women wore long skirts. Both men and women wore deerskin shirts or blouses and soft shoes made of leather called moccasins. Did they have Mohawk hair styles? The men of the Iroquois Nation shaved their heads except for a strip down the middle. Even though this is called a Mohawk haircut today, many of the Iroquois tribesmen (not just the Mohawk) cut their hair like this. Girls would wear two braids in their hair until they got married, then they would have a single braid. Even though longhouses were more permanent structures, the village would move every 10 years or so to find fresh land and hunting grounds. Up to 60 people would live in a single longhouse. As long as there was food, no one ever went hungry in a village as food was freely shared. There was a trail that connected the Five Nations called the Iroquois Trail. The Iroquois Great Council still meets today. The women had a large role in social government and even chose the representatives that went to meet at the Great Council. Lacrosse was first played and invented by the Iroquois Indians. They have several different names for the game including Teh hon tsi kwaks eks, Guh jee gwah ai, and Ga lahs.